This “I Am Superman” patch was available everywhere in Metropolis Illinois beginning in the 1990s. Its bold Superman ‘S’ symbol really pops within its red and blue surroundings. In hindsight, in all my years of visiting the Superman Celebration in those days, I’m saddened that I didn’t think to buy more than one of these. February 26, 2019 in CLOTHING / COSTUMES. 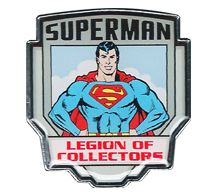 Another great collectible that was included in the 2017 Superman Legion of Collectors box was this amazing “Itʻs a bird, itʻs a plane, its Superman!” patch. The patch, measuring 3 and 3/4 inches, features a stylized interpretation of Jose Garcia Lopez’s classic artwork. January 25, 2019 in CLOTHING / COSTUMES.